Healthy and Beautiful Smiles for the Whole Family! At every age, your dental needs change. Preventive care that effectively protects the smiles of children may not be enough to protect the dental or oral health function of an adult. At Park Place Dental Group, our doctors, Kevin L. Shelton, DDS, John W Gallegos, DDS, and Molly E Stice, DMD offer comprehensive family dentistry that is highly personalized to help patients of all ages achieve healthy, beautiful smiles. If you’re looking for a team of qualified professionals who have the knowledge and expertise to administer quality dental care for treating the needs of your entire family, look no further than our capable team. Contact us at any one of our convenient Glen Carbon or Shiloh offices today to schedule your family’s oral health consultation! Family dentistry, like general dentistry, is concerned with the proper oral hygiene and health of your teeth, gums, and other important aspects of your smile. Family dentistry focuses on the unique smile needs of young patients, children, teens, adults, and seniors. At every stage of life, family dentistry addresses oral health. Children have very different dental needs than adults, and our qualified family dentists provide comprehensive oral care for baby teeth to aging smiles. We have a gentle and compassionate approach that allows children and patients of all ages to develop positive feelings about their regular dental checkups. This also helps develop good oral hygiene habits no matter what stage they are at in life! What Family Dentistry Services Do You Provide? Regular six-month cleanings and exams – Teeth cleanings and six-month exams are extremely important, as they allow our dentists to monitor the health of your smile, and the oral hygiene of your loved ones. Fluoride treatments and dental sealants – Fluoride and dental sealants can help combat cavities and are often recommended for cavity-prone children. Cavity checks and fillings – Cavities are, by far, the most common preventable childhood health condition. We specialize in detecting and treating cavities with fillings. Orthodontics – We also offer orthodontic treatment with Clear Correct aligners for responsible teens and adults. Gum disease treatment – Gum disease is common in adults, so we use procedures like deep cleanings and antibiotics to deal with cases of gingivitis or gum disease. What Can My Family Expect from Their Dental Appointment? Regardless if it’s your child’s first visit with us, or you’re coming in for your bi-annual appointment, your family can expect the following when visiting each of our locations for ensuring your smile’s remain healthy and beautiful. We aim to help patients save time and money by encouraging you to stay on top of your regularly scheduled preventive care appointments. An essential step in maintaining a healthy and beautiful smile is to arrange your dental exams every six months. Regular checkups make it possible for our dentists to detect, diagnose and treat oral health problems before they get worse. Because the smiles of children are still developing, these tests are particularly important for preserving long-lasting health well into adulthood and early removal of dental anxieties. 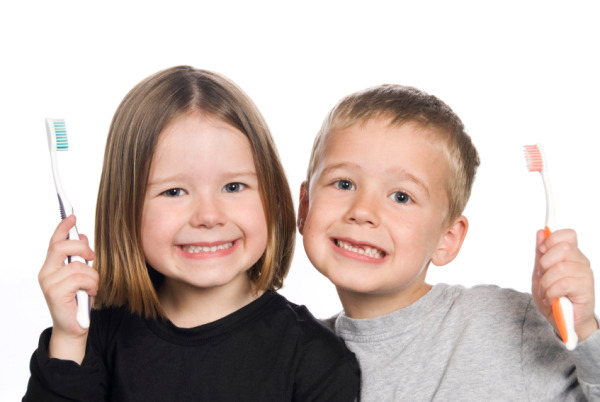 Our team understands how dental work can intimidate children. We strongly encourage parents or guardians to bring children in at an early age, allowing them to understand the importance of dentistry. Each visit includes detailed age-appropriate and comfort-specific dental cleanings. They are necessary for removing plaque buildup that causes tooth decay and gum disease, contributing to long-lasting oral health. After cleaning, our dentists can also provide preventive dental treatments. Preventive services such as fluoride treatments, help teeth become more cavity and decay resistant. Sealants applied to children's molars help prevent against the collection of food debris and bacteria on teeth. Our entire team takes the time to educate patients about positive habits for helping preserve your oral health. Patient education includes a demonstration of proper brushing and flossing techniques using age-appropriate language that is easy to understand. We explain how unhealthy food choices compromise the healthy development of teeth and make recommendations for nutritional diets to minimize the chance of decay. For keeping the smiles of your loved ones healthy, our at-home dental care tips depend on what happens during your family dentistry visits. However, anyone committed to carving out a few minutes each day can set up good home care habits. Consistency is the key to building a healthy habit, like regular exercise. The standard for ideal oral home care is brushing twice a day for at least two minutes and flossing once a day. Even so, it can be difficult to ensure you’re setting the right example for your family when you’re unsure of which dental care products are the best. Our highly-trained hygienists can help you narrow down the options and create a plan that will fit your dental needs with the right hygiene tools. If you stay consistent, even a simple oral health routine can have a positive impact and dramatically reduce the risk of cavities or gum disease. You have so many good reasons to want to keep your family’s teeth and gums healthy. From sparkling smiles, being able to chew properly for good nutrition, to avoiding toothaches and discomfort. And, also, new research suggests that gum disease can lead to other problems throughout the body, including an increased risk of heart disease. How Do I Go About Choosing the Right Family Dentist? Sure, it's important to have a pearly white smile, but there's so much more that goes into achieving great oral health. To maintain excellent oral health, it is essential to make regular visits to a family-friendly dentist like ours. Finding a team of dentists you can trust and who will cater to your personal needs while also ensuring you’re comfortable and satisfied doesn’t have to be difficult. Choosing a family dentist who is accessible, friendly, and provides compassionate patient care, especially if you have younger children, is very important. Some dentists prefer not to treat children or try to make their visits fun and painless. If you want to have a trusted dental home, look for a dentist with a wealth of experience in treating children of all ages and check their online reviews to learn more about how they interact with children. The best way to maintain a healthy smile is to prevent common problems such as cavities and gum disease. A great family dentist should provide comprehensive preventive treatments such as dental sealants, fluoride treatments, gum tissue care, and more. The internet is a great resource if you still have trouble picking a family-friendly dentist. On websites like Yelp, Angie's List, the Better Business Bureau and, of course, Google, you can look at customer reviews for family-friendly dentists in your area. These reviews will give you a better idea of what kind of service and treatment to expect and enable you to choose the right family dentist for you. Got Questions? We Have Answers! Ask Our Doctors! questions and address your concerns. Not sure which questions to be asking? Here are some helpful ones to get you started! Are you up-to-date on the latest dental procedures and technologies? What is your education and credentials? What is the culture of your offices like? What are the types of qualities and personalities do the dentists have? When deciding on the right family dentist, it's important for a dentist to show kindness and have a positive attitude, so you and your loved ones feel safe and comfortable. Need of a Qualified Team of Family Dentists? We believe it’s never too late or too early to experience quality family dentistry and optimal oral health. We look forward to meeting you at your next dental visit! Call our office in Glen Carbon or Shiloh today to get started!